Can be combined with with any herbs recommended for arthritic conditions. 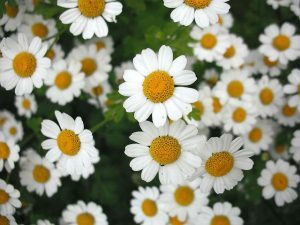 Feverfew is often mistaken for chamomile as the flowers bear resemblence to the Roman Chamomile plant. It has many uses in traditional medicine. Migraines: when the wife of a Welsh doctor ended her 50 year old history of migraines with a course of Feverfew, a detailed scientific investigation was started . In clinical trials in 1960 in Britain, the herb was demonstrated to be an effective remedy for migraine. It is thought that the constituent parthenolide appears to inhibit the release of serotonin with is thought to trigger the migraines. Used in small quantities as a preventative for migraine. Has to be taken on a regular basis and at the first signs of migraine attack. Useful for migraines associated with menstruation and where it is soothing to apply warmth to the head. May also be used for tinnitus and dizziness, especially in combination with other remedies. Fevers: may be used to lower temperature and cool the body. Gynaecological uses: induce menstruaton and also has been given in childbirth to aid expulsion of the placenta. Arthritis: the herb has been shown to be beneficial in helping arthritic and rheumatic pain. During the inflammatory stage this is especially so. Works well in combination with other herbs for these conditions. Earache: Relieved by a cold infusion. Insect Bites: Tincture of Feverfew relieves the pain and swelling caused by the bite. Contraindications: Should not be used during pregnancy because of the stimulant action on the womb. The fresh leaves may cause mouth ulcers in sensitive individual. Can have an abortifacient effect and long term use will cause mouth ulcers.